Releases After Successful Rehabilitation! — Raptor Education Group, Inc. Releases! Barred Owl,Two Pileated Woodpeckers Home Again After Successful Rehabilitation! We have a break in the harsh winter weather! Seeing the sun is so exciting after months of snow and temperatures We are taking advantage of the nice days and the optimistic forecast by moving some patients and education birds to outside mews and enclosure. There are DELIGHTED! We've had some exciting releases in the past few days. On November 10, Danny Uran found a Barred Owl at his workplace near Antigo. He called REGI for help. Our Avian Tech Greg Russ and fall intern,Teagan Iwanski went on the rescue to bring the owl back to REGI. The owl had a head and wing injury, likely from hitting the side of a metal building. She made excellent progress and after a month in rehabilitation, was ready to go home. Danny Uran and his son Owen had the honors of releasing her back to the wild. The young female owl wasted no time leaving Danny's hand and flew strongly into the sunset after she saw the open field and mature trees...her perfect habitat. We wish her luck in the future for her second chance at life. Barred Owl breeding season is around the corner. She has just enough time to find a handsome forever mate. Thank you Danny for reporting her when she needed help and thank you for releasing her back to her world. A lovely female Pileated Woodpecker was hit by a vehicle in Wittenberg. REGI transporter Cheri Bowman and her family brought her to us for care. After five weeks, she had healed and was ready to go home. She was so excited to see trees and know she would have another chance at life. She left my hands and with a few loud yells, flew almost straight up to a tall tree and after then quickly on again. Good luck sweet girl. Thanks Cheri and Benny for recovering her and making the drive. Mary Moscherosch of Merrill found a handsome adult male Pileated Woodpecker that hit a window. He was seeing stars and not moving a lot. The female Pileated, his mate was screaming for help. Mary scooped him up and brought him to REGI tor evaluation. After a fews days he was ready to go home. Mary was able to come to REGI to pick him up and take him home to his very excited mate. Thank you Mary for caring about him and getting him the help he needed and for releasing him. It is a good day when we can release patients back home after they recover from whatever injury or problem they may have encountered. Sunshine and freedom equals happiness. 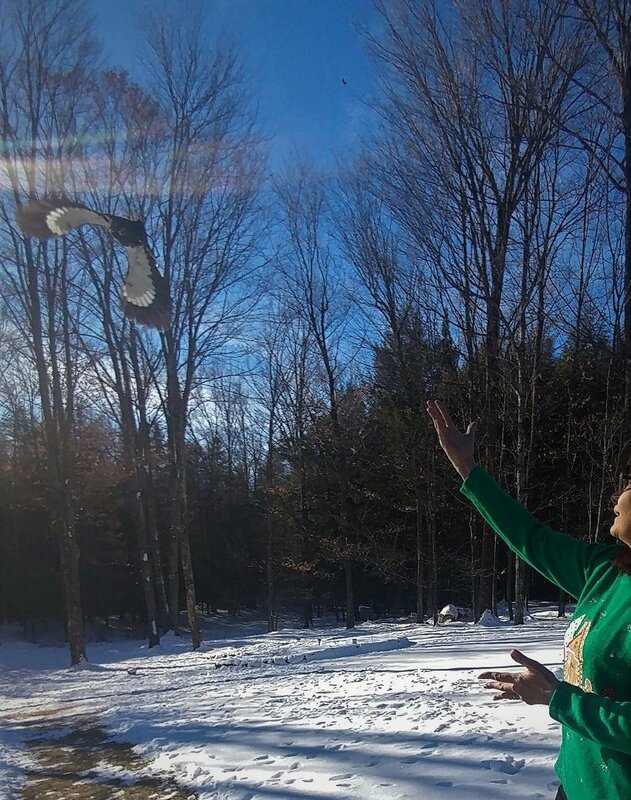 The birds released are those that winter in our area and are acclimated for our harsh winter weather. 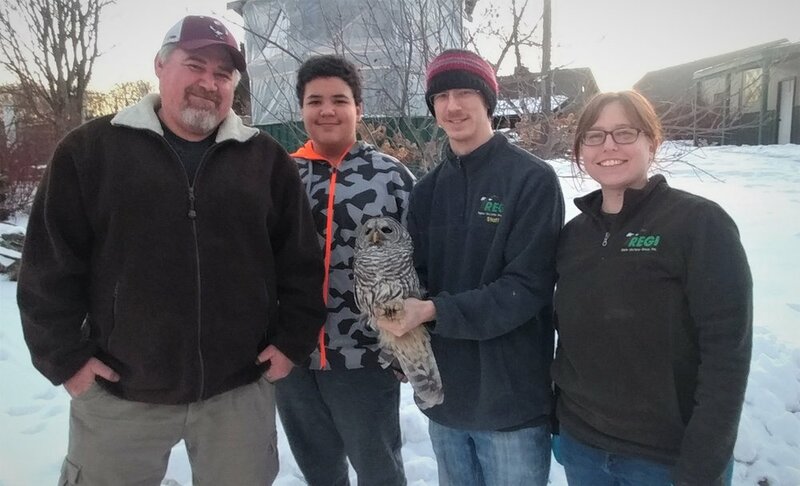 Danny Uran and his son Owen Uran with Avian Technician Greg Russ and Wildlife Rehabilitator/Clinic Manager Ashley Nilsson. 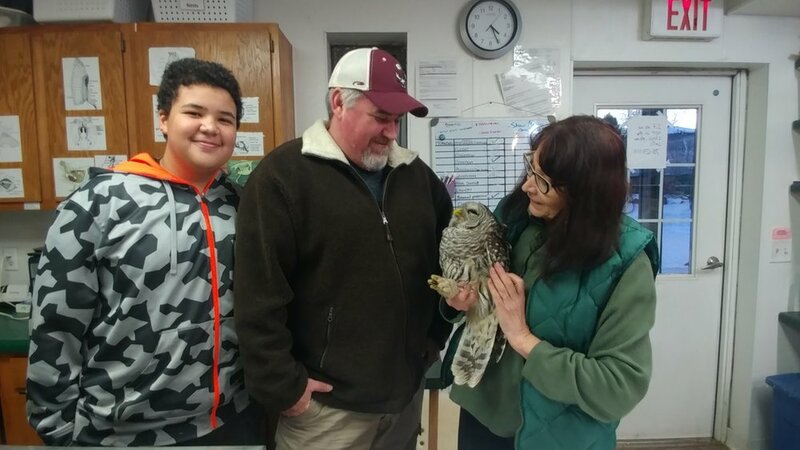 Danny and Owen get to visit with the Barred Owl at the REGI clinic just before her release back to the wild. Into Dannys hands for release. He will be the last person to ever touch her! The Barred owl is scanning the area with her mind on freedom as we snap one quick photo. And she is off to her destiny! Good luck sweet girl! Owls are birds of the night and are released during twilight. Perfect feathers and perfect flight! That is what we like to see as she heads home. She wastes no time getting into the trees and beyond. 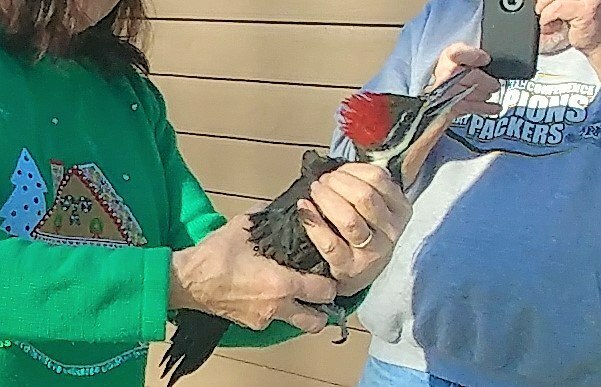 Handsome adult male Pileated Woodpecker hit a window in Merrill and went home a few days later. 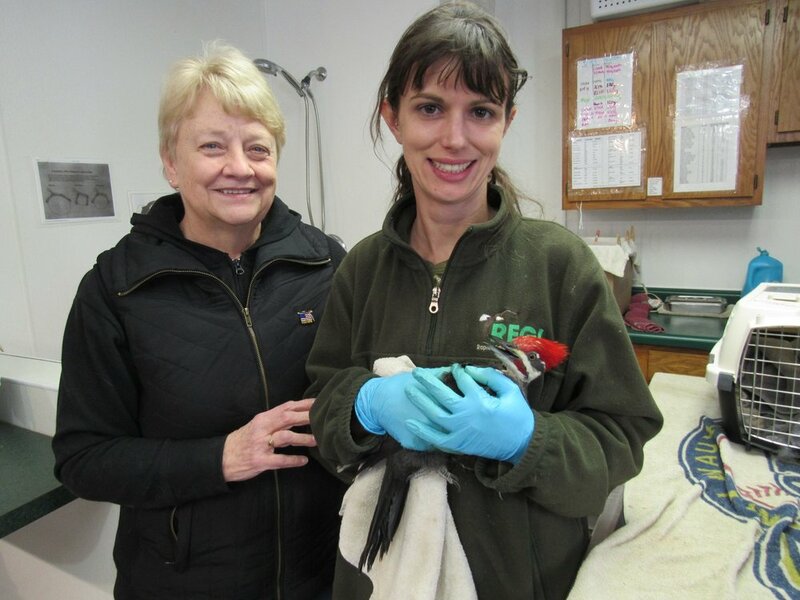 Mary M. found the injured woodpecker, brought him in for care and then released him. His mate was very happy he came back home again. Thanks so much Mary.